Participation denotes the process of sharing decisions which affect one's life and the life of the community in which one lives. One of the fundamental rights of human being is the right to have their say on the matters affecting their affairs. But question is: Should children also have such rights? Children welfare laws are made by the adults and practiced by the adults for children but the cause for these activities i.e. Children do not have any direct access in the entire process. Children often do not know that they have rights. The basic premise of children law is that: they are not the holder of rights rather they are mere object of the law. The successful working of any mechanism depends on participation. In the present write up an attempt has been made to discuss the need of children's participation in law. Article 25 of the Universal Declaration of Human Rights (UDHR) states that every one has the right to a standard of living, adequate health and well being, including food, clothing, housing, medical care and necessary social services. Child participation is one of the basic principles of the Convention on the Rights of the Child (CRC). The Convention makes it clear that children are independent subjects and have their own rights. Article 12 of the Convention makes a strong urge for children's participation: State Parties shall assure to the child who is capable of forming his or her own views the right to express those views freely in all matters affecting the child, the views of the child being given due weight in accordance with the age and maturity of the child. Article 12 clearly declares that right to participate is a fundamental right of the child and it stands on its own. Article 13 of the Convention reads: The child shall have the right to freedom of expression; this right shall include freedom to seek, receive and impart information and ideas of all kinds, regardless of frontiers, either orally, in writing or in print, in the form of art or through any other media of the child's choice. CRC recognises the potential of the child to enrich decision-making process, prepares him to participate as a citizen, the provisions emphasis the right of the child to participate in decision making process that may be appropriate for their lives and influence decisions taken for them in the family, in the school or in the community. Bangladesh as a party to CRC is obliged to promote these rights. In Bangladesh there is no comprehensive national legislation concerning the rights of children. The substantive law on the child is the Children Act 1974 which predate the Convention on the rights of Child. As a result Bangladesh lacks in legal framework on the rights out lined in CRC. How ever in spite of not having any legal obligation, the Courts some times take into consideration the opinion of child; especially in divorce cases the Court gives value to the view of the child to determine its custody. The society desires that our children will become responsible and law abiding good citizens. But it is not fair to expect the children to become responsible with out prior exposure to the skills and responsibilities. Suddenly children cannot become what society desires. Participation with adults in meaningful projects will gradually make children a responsible one. The Constitution of Bangladesh guarantees certain rights to child. It safeguards the fundamental rights of child to life, liberty, and equality under the Law, protection of the Law, Freedom from torture and prohibition from forced labour. In order to uphold these rights apart from statutory laws, the Government undertakes many programs for children. The adults make decisions about government policies. But we need to remember that children know a lot about their own lives. The government is taking decisions about children's benefit on the basis of information given by adults. We cannot deny that adults cannot think, feel and see life as a child does. If adults listen to child, give them a platform to speak, allow them to share their views, the decisions taken for children would have been more effective. The first place where children participation needs to be ensured is in the family. The family members need to be available to listen and understand children, to give them the time and space for them to make them feel confident and encourage them to express their opinions. The school also plays a decisive role in this process. When these things are practiced, participation of children in community life becomes easier. The children need to understand that when they will acquire certain rights, responsibilities will also come along with it. The adults of the society are matured and experienced than the children. To prepare the children to take these responsibilities collaborative activities with the adults need to be in progress. At the same time it should be assured that the opportunity to participate is equally available to both male and female child. From the early ages children try to understand how they can expressively participate in society. Children have a tremendous power to organize them selves. It is evident (in a negative way) from different child gang activities. For that children need to engage in mutual activities with adults. Establishment of children club may be taken as a good example. UNICEF (United Nations International Children's Emergency Fund) has taken many programmes in Bangladesh regarding child participation. 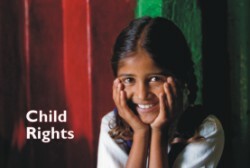 UNICEF collaborates with various media agencies to advocate for children's right. The first national Children's opinion poll was conducted by UNICEF in 2005 to find out what issues most concern young people. The second national poll in 2008 focused on vulnerability, disparity and discrimination. We need to maintain that involvement of children must be completely voluntary. Children should not be used by adults for the attainment of their own purpose. The child laws of Bangladesh may be amended in the light of CRC. Participation of children should not be confine to involve children in some events and activities; it is a right in itself and need to be practice to serve the best interest of the child.